... interventions Useful with renovations Intervention checking Composition GESS FON PB® an insulating panel made up of plasterboard RB 13 and a lead sheet 0.5 mm, 1 mm or 2 mm. 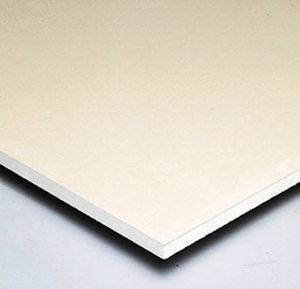 Drywall, or plasterboard consists of a layer of gypsum plaster pressed between two thick sheets of paper. This basic element of modern wall, partition and ceiling construction saves time over traditional, hand-plastering techniques. ArchiExpo offers numerous types suitable for different applications, including waterproof, fireproof, thermal and acoustic insulating drywall. These sheets are used primarily for interior wall and ceiling construction. They can be mounted on either a metal or a wooden framework. Drywall partitions offer the advantage of being lighter than other types.